Keeping in constant communication with your customers is a necessity for most businesses now days. Most companies do this via email and SMS messaging, but keeping in contact via Facebook Messenger can also be a great tool in increasing sales and customer satisfaction. Even better, having a Facebook Messaging BOT to automate your customer’s initial incoming messages can cut down on costs, and help your company be more productive and efficient. Over the last few months I was tasked with integrating Facebook’s Messenger API into a popular SaaS platform, so this tutorial will get your feet wet with the Messenger API in general, and then show you how to get started integrating the Messenger API with your company’s platform using Laravel 5. First create a Facebook developer account (if you don’t already have one), then create an app, a page, and then add the messenger product. This Quick Start Guide will guide you through the Facebook app procedure quickly. Alright… Now let’s get started! First we need to create our routes.. Create a route group in your routing file and add the following two routes. Next up, just like any Laravel route, we need to create our Facebook Controller with the following two methods that the above routes are referencing. ** NOTE: To understand why this method is needed, refer to the Facebook Messenger API docs. Our second method, facebookMessage is the entry point for all incoming messages from our Facebook User. First, we get our Request, process the object’s JSON and then pass our payload off to our message handler. Our message handler is located in in our Facebook Manager service. This Service is used to process our incoming messages FROM the Facebook Messenger API, along with any handling (i.e. saving the message, creating a customer, etc). Our entry point to our Facebook Manager service is the method incomingMessageHandler. This method contains a switch statement that is used to parse our JSON that is passed to it from the controller for the sender ID, the recipient ID, the actual message, and any other metadata that is needed for our application. For this tutorial all we care about is the sender and recipient IDS and the message. For more information on all the available fields reference the Facebook Messenger API docs. Our next method setConversationParticipants is pretty self explanatory. It is used to set the IDs of both the sender and the recipient. ** NOTE: The sender ID and recipient ID reverse when we are parsing an ECHO message. To learn more about echo messages, and their purpose reference the Messenger API. The next methods are our setFacebookPageByPageId and setFacebookUserBySenderId. These methods are used to set the recipient ID (non echo message), and sender ID (non echo message) in our class to use when needed. This let’s us know which message came from which party. Code tracing through the code brings us to the createOrUpdateCustomer and getFacebookUserBasicInfo methods. These methods are used to check our database if our customer is already in our DB, and if so retrieve that model, if not we save this Facebook User as a new customer. Our Facebook User is referenced by the Facebook Sender ID that we parse out in the incoming JSON. If this Facebook User is new and not a customer in our database, we then use our basic info method together with our Facebook User’s Sender ID to retrieve the user’s first name, last name, and avatar image from the Facebook Graph API. Next is our setFacebookPageByPageId method. This method is how we keep track and reference the Facebook Page (your company’s page) that the Facebook User is talking to. In our Customer’s table we save the Facebook User’s senderID, and in our Page table, we save the Facebook Page’s page ID (usually the recipient ID if not an echo message). OK… Enough talking… Let’s take a look at the actual code..
* Verify the Facebook challenge. // to the API in order "echo"
* Set our Facebook User's incoming message. * sender & recipient IDs reversed. * Page is the page that the user is sending messages to. * can use it to create our new customer. // Save or do something cool with your Facebook User's message. ** Note: This tutorial already assumes you have a Customer and FacebookPage Model created and that your database is in sync with them. Now let’s take a look at our model retrieval method inside our Facebook Repository. This method is used to lookup our FacebookPage information (so the Facebook User (customer) is communicating with the correct Facebook Page (your employee)). Now that we know how to process incoming messages from our Facebook User (customer), let’s see how we can use our FacebookManager Outgoing MessageService to send a message to the Facebook Messenger API from our Facebook Page (employee) and ultimately to our Facebook User (customer). For HTTP requests we will be using Guzzle. The first method getFacebookUserBasicInfo is how we query the Facebook Messenger API for basic Facebook User information. Reference the API docs to see all of the available information that you can retrieve with the Facebook User’s Sender ID. The next method, our sendMessageToFacebookUser is used to send the actual message FROM our Facebook Page (employee) TO our Facebook User (customer). First, we retrieve our Page API key that is stored in our config file, our Page token (stored also in our FacebookPage table), and our Facebook User’s Sender ID, and then concatenate them along with the URI to send a message to our Facebook User. And finally a quick look at your Facebook Configuration. Add the following (update with your values) the config tokens in your .env file. Now the only value that will be pulled from your database will be the Page Access Token, the Page ID, for your Facebook Page, and the Facebook User’s Sender ID for your Customer. Recently I’ve had to rewrite portions of a PHP legacy application that was written in a company’s proprietary legacy framework, in order for it to be test friendly and much more maintainable. In order to accomplish this, I’ve added a few key Symfony components to their framework. The result was that the application was easier to test, easier to cache, and much much easier to maintain than it was previously. Their front controller was stripped and completely rewritten to implement Symfony’s HTTP Foundation and Symfony’s Routing. Let’s take a look at a snippet of the front controller. // service from my DI container. // of AppKernel (shown below) in place of this. Now let’s take a look at our App Kernel. Our App Kernel is the engine that will dynamically instantiate our application’s Routing and Controller objects. It is responsible for asking our matcher if the incoming Request object contains a URL string with a valid route, and if so, resolving the correct controller for that valid route. Let’s take a look at a snippet of our App Kernel. // Again this injected from my DI container. // controller (see controller below). // to the client you can invoke them here. // unique name for this route. // object with our route. And there you have it. As you can see, this design decouples a lot of functionality from the application, which in this case, makes writing tests actually possible, where before automated testing wasn’t really possible. And.. If you combine this with a Dependency Injection container, the result is even more flexibility and a code base that is much more maintainable. This tutorial will show you how to create a high performance PHP (or any language really) development environment using the JetBrains IntelliJ Idea IDE (with the PHP plugin), Vagrant 1.8.1 (latest version as of this post), VMware Workstation Pro 12, and good ole Ubuntu Trusty (14.04.3 with the vivid HWE stack). 😀 We will be using the vivid 3.19.43 kernel. We also will be using native PHP 5.5.9 (but php-fpm, PHP 7, or HHVM would be even more awesome 😀 ) and XDebug as our remote debugger. **Note: This tutorial assumes you have Vagrant, VMware, and Jetbrains IntelliJ Idea already installed and functioning on your host OS. It also assumes you already know how to install a guest OS in VMware. First update/install all necessary Ubuntu packages in the VM. Configure our VM according to Vagrant standards. Configure Xdebug for Apache (although Nginx is a similar process). Turn our newly configured Ubuntu Virtual Machine into our own Vagrant base box with VMware as the provider. Configure our JetBrains IntelliJ Idea IDE (PHPstorm will work also) to work with our remote PHP interpreter and remote Xdebug debugger running in the VM. Lastly we will benchmark our VM development environment’s performance using wrk. **Note: This tutorial will use VMware Workstation 12 (but other VMware versions will probably work as well). **Note: This tutorial also assumes you have a valid Vagrant VMware plugin license in order to interface Vagrant with VMware Workstation. First do a minimal install of Ubuntu Trusty as a guest OS Virtual Machine using VMware Workstation. If you don’t know how to do that, there are many tutorials available. **Note: When you install Ubuntu, since we’re creating a Vagrant base box, it is usually best to follow the Vagrant standard. If you plan to share your base box with the public, using the Vagrant insecure settings is the standard way to configure it. This means the user should be vagrant with password vagrant, and the root password should be set to vagrant as well. However, if this base box is only for your team and you don’t want it to be shared with anyone outside of your organization, then obviously the standard settings should be set to something much more secure. At this point you should now have a minimal install of Ubuntu 14.04.3 (14.04.2 is fine also). We’re now going to update the system, install the Ubuntu HWE stack, and then install all necessary packages for our LAMP stack and Vagrant Base Box. At this point, if everything went well, you should be on the 3.19.0-43-vivid kernel. Next, let’s install our LAMP stack. Next let’s make sure our NFS client is installed since we want Vagrant to spin up our VM using NFS (just like in Virtual Box) for greater performance. Next, make sure you install any other packages you need in your stack. Maybe you need Node? Mongo? Full MEAN stack? Redis? Java? Python? Ruby? Puppet/Chef? Install any language, RDBMS, NoSQL DB, framework, or any platform that you need for you tech stack. Since our base box will be our template VM, we don’t want to have to install anything after it is created. Lastly let’s install wrk so we can benchmark our HTTP requests. But first, let’s make sure git is installed and if it isn’t, we want to install it. Let’s first configure our VM according to the Vagrant Base Box standard. Since we’ve already created a user with a user/password combo as vagrant/vagrant and root has the password vagrant, the first step is done. Next, we don’t want to be asked for a password when using sudo. // append to the end and comment out any line containing "requiretty"
Next up, let’s create the insecure public key the Vagrant will look for so Vagrant can log us in with our key instead. Now we need to make sure our authorized_keys file has the correct permissions. Next, up let’s enable and configure Xdebug and while we’re at it, let’s also enable mod_rewrite. Next up, let’s configure a Vhost to be used as a template. Our Vhost will point to our NFS shared directory between our host and guest OS. Now we want to enable our vagrant-dev.conf vhost. Now let’s symlink our “html” directory to our soon to be Vagrant’s default shared directory. **Note: You can point the vhost’s document root directly to the shared directory also. Next, since we don’t want to run a DNS server for a development environment, let’s manually point to this vhost. That should be it for our VM configuration! Now shutdown the VM, and let’s turn it into a base box with VMware Workstation as the provider. Now we’re back on our host OS. Navigate on the host OS, to the directory where your Virtual Machine is stored. There should be files with extensions .nvram, .vmdk, .vmsd, .vmx, .vmxf, and some log files. We need to first create a metadata.json file that Vagrant will read when creating the base box. This file can be detailed, containing provider and versioning info, but we are only going to use the bare minimum for this tutorial. You can learn more on the Vagrant site for more info on base box meta data, since this probably doesn’t meet your organization’s needs. We want to tar all of the files in the VM directory into a .box archive. Now that we have our VM as a base box, let’s now add it to Vagrant. Now let’s take a look at our list of base boxes. Now let’s configure our Vagrant init file, by going to the root directory of our code. Now add to your code’s Vagrantfile inside “Vagrant.configure” the following. // Give the vm all of your cores and half of your ram. Now let’s edit our host OS hosts file to point to Vagrant. Launch JetBrains IntelliJ Idea and install the PHP and Vagrant Plugins. You can search for them under “Settings -> Plugins”. After they’re installed, restart the IDE and go to “Settings -> Languages & Frameworks -> PHP -> Servers” and create a new server. Next, click “Use path mappings” and for “File/Directory” set it to the root directory for your code base (on your host OS). For “Absolute path on the server”, set it to the shared Vagrant directory “/vagrant_data”. Now go to “Settings -> Languages & Frameworks -> PHP” and click the “…” and create a new “Remote Interpreter”. In the Vagrant plugin tab, enter the SSH credentials for the user “vagrant” we created in our VM, and under “PHP executable”, click the “Reload/Refresh” button. This should search for the remote PHP interpreter running inside the VM and load it. After it is found click “Apply” to save and exit. Next, we need to configure XDebug in the IDE. Go to “Settings -> Languages & Frameworks -> Debug” and make sure “Can accept external connections” is checked, and change the “Debug port” to “9009” (which is what we set Xdebug to inside the VM). Now all thats left to do is to test our NFS performance in the VM with http requests using wrk. And that’s it! Everything should be working..
Node.js relies on asynchronous Input and Output (I/O) in order to increase the computing efficiency and speed of an application. This article will take a basic look at what asynchronous programming actually means, and why asynchronous I/O is important in a language like Node.js. For Node.js performance to be actualized, a certain programming paradigm must be followed. Node.js is an event-driven architecture, and relies on asynchronous (non-blocking) input/output calls, along with the Node.js event loop to gain performance. This means that calls made in Node.js to the file system, event loop, or any resource, must be done asynchronously. Asynchronous programming, informally, means code that is not waiting for a call to return. This is done using callbacks and registering them with an event-listener. Let’s take a look at the difference between a simple asynchronous (non-blocking) call versus a synchronous (blocking) call. First, notice the getRemoteData(request) call. If we’re on the client-side, and we make a synchronous call, the user’s browser is in a waiting state and frozen until the call is completed. The rest of the code cannot be executed until this call has returned. If we’re on the server-side, and in Node.js we have an incoming request added to the event loop, but this request is a synchronous call, then we have a problem. If this synchronous call is to read or write to the file system, when executed, the entire event queue will be blocked and in a waiting state. No other calls in the event queue can be performed, because the server is halted and waiting for the blocking call to finish. The speed and through-put of our application ultimately depends on how fast each synchronous call is completed. Since Node.js is single threaded the entire application will be blocked and waiting, which is obviously very bad. Now let’s take a look at the same simple calls, but this time performed asynchronously. Our inline anonymous callback function will fire, and the response will be passed as a dynamic argument when getRemoteData() returns. What is important is our code continues to execute the line after getRemoteData() immediately. It does not wait for the call response to return. This is referred to as an asynchronous (non-blocking) call. Programming in a purely asynchronous fashion is what makes Node.js so powerful. Now, it is true that many mainstream languages support concurrency. And it is also true, that they also have asynchronous I/O support. However, the problem is that the majority of these languages have only concurrency and asynchronous “features”. In most languages, concurrency support was added long after the language’s release. Node.js nearly only supports asynchronous programming and was developed purely with the asynchronous paradigm as a fore-front of its design. Everyone always talks about the Node.js event loop and how its important, but what exactly is it responsible for? The event loop (event queue) in Node.js is a loop that is responsible for processesing incoming requests. This loop “contains” a queue of requests, and each request in the event loop is a callback. Since the Node.js event loop contains a queue, it processes the requests like a traditional queue First-In-First-Out (FIFO) fashion. Node.js will continue processing each callback in the event loop until there are no more callbacks left to process. In order to do this, Node.js registers with the Operating System. When an request arrives, Node.js is alerted, and the event loop processes the request. Any other subsequent connections that are made are queued until Node.js has finished with the current request. The event loop allows Node.js to scale efficiently by accepting (queueing) many requests at once. Efficient scaling is one of the benefits that Node.js (with the event loop) has over traditional web servers. 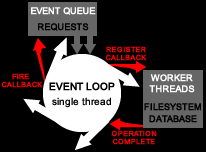 The event loop is single-threaded. This allows Node.js (when used properly) to require far less computational resources than traditional web servers. Traditional web servers like Apache or Nginx are multi-threaded. Multi-threaded web servers typically cannot scale to the magnitude that Node.js can without greatly increasing the system’s computing resources. Since multi-threaded web servers create a new thread for each incoming request, this increases both CPU and RAM requirements of the system for the same amount of traffic. This increase can be either positive or negative (depending on your application), but the amount of computing resources for multi-threaded web servers will be greater than the requirement for single-threaded ones. And that’s it on the Node.js event loop for now! Let’s take a look at how each pattern works. **Note: By convention, the first letter of a constructor function is always capitalized. A function is not a property of an object when the function is invoked using the Function Invocation Pattern. If the function is invoked with this pattern, the this parameter becomes bound to the global object, and this can become a problem. OK, let’s first take a look at the Function Invocation Pattern, and then since binding to the global object is bad, we’ll take a look at how a standardized work around is implemented when a function is invoked inside a method. As mentioned, when a function is stored as a property of an object, that property is called a method. When a method is invoked, the this parameter is bound to that method, and that method is a function object. Running a Node.js application along side other non node web applications can work well if configured correctly. This tutorial will show you how to easily configure a Virtual Host to proxy Node.js application requests through Apache. First, we need to make sure that we have Node.js running on a port other than the port Apache is running on (usually port 80). Our goal is to run the Node.js server on a port other than 80, and then use Apache to proxy incoming Node.js application requests to the port that the Node.js server is running on. First, we need to make sure that Apache has the mod_proxy.so and mod_proxy_http.so modules loaded. If they are not loaded, go uncomment them in the Apache configuration file, and then restart the server. Next, we need to configure an Apache Virtual Host just like we would any other VHost, except we want to proxy all domain requests for your Node.js application to the Node.js server. **Note: The process is also the same if only a portion of an application is using Node.js. **Note: This configuration assumes that the node.js server is already running locally on port 3000, but it could be configured to use any unused port and/or an IP, that points to a system that is not the same as the one that Apache is running on. Next, we need to tell Apache to proxy all node.js requests to node.js. This is done in our location directive with ProxyPass. All domain requests for www.yoursite.com will proxy to the node.js server running locally on port 3000. Our ProxyPassReverse is used if/when our application performs a redirect, however its usually good practice to add even if your application isn’t redirecting. For example, if our Virtual Host proxies incoming requests to our node.js application running at localhost on port 3000, and if our application performs a HTTP 301 or 302 redirect for one of those requests, there we be an error. Our response headers will contain a location of http://127.0.0.1:3000/your/site/location/redirected-location when sent back to Apache. And as you can tell, if Apache sends this location back to the client, then there will more than likely be an error. ProxyPassReverse solves this by rewriting the location in our response headers so that Apache sends yoursite.com/redirected-location back to the client’s browser. After that, save your Virtual Host configuration for your node.js application, and restart Apache. All incoming requests to yoursite.com should now be proxied to your node.js application. In event-driven programming, once an event occurs, its registered callback to that event fires off its functionality. An event could occur from many varying incidents, such as removing an input field from a web form, or retrieving data from a remote web service. The data returned from calling our remote web service, fires the callback function with either the data or an error returned as a dynamic argument. The reason is due to a specific condition will not fire, unless it occurs. We create a promise variable named promiseData and then call the remote web service like before. If any side effects occur, such as an error, we don’t have to check for this condition, because our then method will only fire the callback if the data is returned. If the data does not return, the then method never executes. And that’s it! There’s obviously a million other examples between the two, but this gives an simple clear cut practical solution on why you would use promises. Replication in MySQL is keeping databases somewhat “in sync”, minus the latency at least.. So let’s pray to the computer gods (maybe Ava in Ex Machina?) 🙂 that we don’t run into any weird, complex, race conditions.. There are multiple ways to do data replication in MySQL and if your database isn’t very big, then true MySQL replication is probably overkill. First, you could just write a bash script that runs as a cronjob on the host machine to mysqldump and save. Then on the client write and run a bash script as a cronjob to grab from the host and import the mysqldump into the database. But this obviously isn’t going to be ideal with anything other than small ‘toy’ databases. So we need some awesome automated replication-like feature that only updates child databases with changes that are made in the parent database as it changes. Have no fear, MySQL has had such a feature built into its core pretty much since its inception! Now, if you’re reading this, I’m sure you know the benefits of an SSH tunnel, but if you don’t, well…. SSH tunneling is a cheap (and ghetto) way to keep our data transfer done in a secure fashion while at the same time minimizing open ports and keeping our attack surface minimal. Enough said.. So let’s get started! **NOTE: Setting up an SSH tunnel is beyond the scope of this tutorial unfortunately, so search for one of the million tutorials on how to setup up a SSH Tunnel (with keys) if you need help and then come back..
First we need to configure our Master. The “master” MySQL server is the one that will be changing. The data that changes in the Master will then propagate and be replicated in the slave(s). # binary logs take massive disk space, this removes logs after 10 days. # Change to an appropriate time frame for your needs. Next, let’s create a MySQL user to specifically do the replication. Next, grant permissions to the new replicator account. NOTE: We only create this account on the master, this will be the account the slave uses to access the master via the slave machine. Next, we need to check our master’s status. Take note of what is under “File”, meaning write down mysql-bin.000001 along with the “Position” of 107. You need these values on the slave(s). **NOTE: Don’t exit from the mysql terminal, open a new terminal to do the dump. Trust me. Everything written to the master db should propagate to the slave(s) almost instantly. You can add read_only flags, replicate only specific tables, and just have a more detailed and complicated use case, but that’s out of the scope of this tutorial. The Decorator Pattern is a highly used Object Oriented structural design pattern, that gives the ability to attach additional responsibilities to an object dynamically, without sub-classing. When this pattern is used correctly, it can be extremely powerful due to the flexibility it offers. Now you’ve probably seen the Decorator Pattern implemented multiple times in many Object Oriented languages, so to change it up a bit, we’ll compare the implementation in both Classical inheritance and Psuedo-Classical inheritance with some Prototype inheritance functionality. Before we start, let’s talk about why you would even consider using the Decorator pattern, by giving a practical example. Now, in our restaurant’s system, we have a drink application that contains a subsystem which calculates the price of different drinks that this restaurant sells. However, since we don’t live in a perfect world, we assume that not every customer will want to order a drink exactly the way it’s specified on the menu. Since declining custom drink orders is bad for business, and the number of possible drink combinations are high, we are going to have to think about our design thoroughly. Sub-classing for every current and future drink type *combination* would become a maintenance nightmare, therefore another approach must be taken. **NOTE: Before we start, I also want to make a point that this design is not what you would do for any real application, much less a production application. Well for one, we wouldn’t just throw all of our concrete subclass “decorations” (Red Bull, Orange Juice, Monster, etc) all into a single hierarchy under the Decorator. Well, besides being a liquid… But with good Object Oriented Analysis and Design, along with being a production restaurant application, that is clearly not enough. That’s assuming that this application will *actually* need to be maintained in the future. Well, what would happen if we wanted to decorate our drink with fruit? or what about a napkin? As you can see, those objects aren’t anywhere near related to each other. So these issues (along with many others) are the reason our Object Oriented design for the entire restaurant system needs to be thoroughly thought out. The reason I have it implemented like this, is to keep it simple..
By doing so, we can focus all of our attention on the actual Decorator Pattern, and what it is doing, without confusion. First, starting in our client code (Drink.java), we create a new drink by instantiating the concrete subclass Grey Goose as a type Vodka. We do this by instantiating a concrete subclass of one of our “decorations”, and then inject our drink object (Grey Goose) into our Red Bull object. 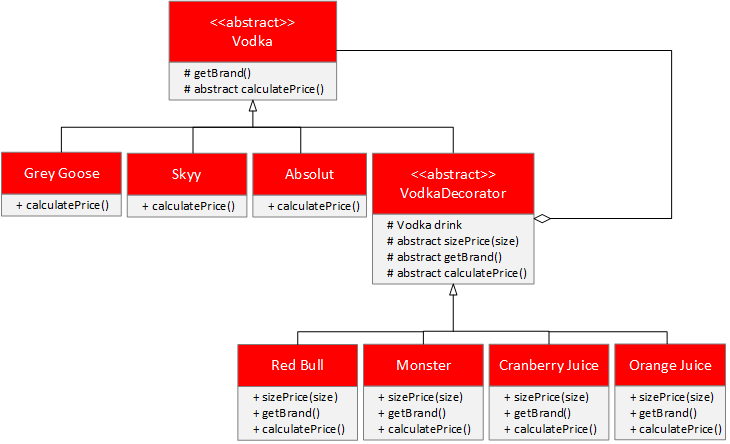 By decorating (wrapping) our drink object, this will allow us to polymorphically call calculatePrice() on both objects (when unwrapping), since both Vodka subclasses and VodkaDecorator subclasses are of type Vodka. **NOTE: Notice how our VodkaDecorator not only inherits from our abstract base class Vodka, but it also composes a Vodka object. If you haven’t already seen why, having our VodkaDecorator inherit from Vodka and compose Vodka is extremely important. Our decorations (RedBull, Monster, etc.) need to have the same “interface” as the object they’re decorating. 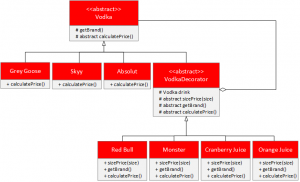 With VodkaDecorator, we’re using inheritance in order to gain the same super-type as our drink objects, but we’re using composition in order to gain behavior. Gaining behavior through composition is where our flexibility comes from. If we didn’t, and gained our behavior through inheritance alone, then any needed behavior would have to be determined at compile time only from what our Vodka base class can offer. Since we’re using composition we can mix our decorations in any order at runtime! And that’s really all there is to it.. We can use as many or as few decorations that we need for our drink. We could pass our drink object to multiple RedBull objects, or one Red Bull, one Orange Juice, and one Monster (like the implementation does), or none at all.. This is why this type of inheritance implementation is referred to as “pseudo-classical”. In true prototypal inheritance we have no need for classes, whether real or simulated, so abstracting a classical inheritance hierarchy doesn’t make much sense. The decorator pattern offers powerful flexibility when used appropriately and it will prove itself to be a powerful tool in your Object Oriented toolbox. I'm full stack software developer that specializes in developing custom software that aid clients in business, productivity, entertainment, and communication.